I am [Achilles'] squire [therapon], and one and the same well-wrought ship brought us. I am one of the MYRMIDONS; my father is Polyktor. He is indeed rich in substance, and an old man, just as you are. He has six sons, and I myself am the seventh. From these sons, chosen by the casting of lots, I have come here. And now, I have come from the plain, from the [Greek] ships. For at dawn the bright-eyed Achaeans will set the battle array around the city [of Troy]. For it annoys them to just sit there, and the leaders [basileis `chieftains'] of the Achaeans [Greeks] do not have the ability to hold them back in their eagerness for war. But, O Commander-in-chief (Wanax), take good advice yourself, and listen to someone else. Do not casually dismiss my advice. Separate your soldiers by tribe [phyle] and by clans (phratries), O Agamemnon, so that one clan may bring aid to another, and one tribe to another. If you do it this way, and the Achaeans obey you, you will then know who among the chieftains and who among the soldiers is a coward and who is brave. For each man will fight for his own. And so you will know whether it is actually by the Will of Heaven that you will not seize the city, or whether because of the cowardice of the men and their foolishness in war. 50 ships X 50 men per ship = 2500 Myrmidons. 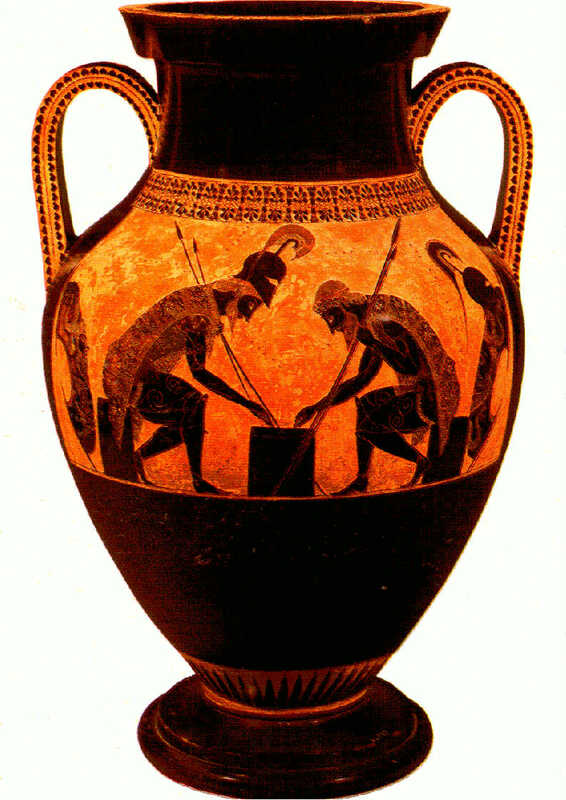 In Book II of the Iliad, the total number of ships is said to be 1083; thus the entire Greek army numbered 54,150 men.